CD137 and CD137L belong to the tumor necrosis factor (TNF) superfamily, a group of cysteine-rich cell surface molecules.With a few exceptions, both CD137 and its ligand, CD137L, are activation induced. 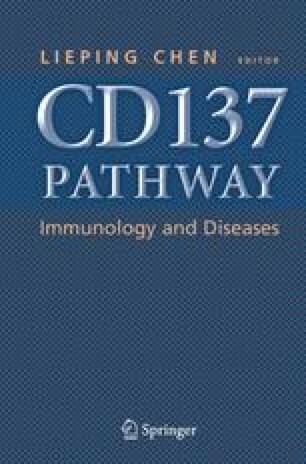 CD137 activates CD8+ T cells more strongly than CD4+ T cells, and is a potent inducer of IFN-γ. Stimulation through CD137L also relays activation signals toBcells and monocytes. These signals elicit activation of NF-κB via the TRAF-NIK pathway and lead to the induction of a plethora of immune modulators that accentuate the ongoing immune reaction. CD137 and CD137L-deficient mice develop normally, have normal numbers of T and B cells and only demonstrate modest immune malfunction. However, in vivo administration of agonistic anti-CD137 mAb protects strongly against a variety of autoimmune and non-autoimmune diseases. The basis of this protection is unclear; however, it seems to involve an indoleamine dioxygenase (IDO)-dependent process in which pathogenic T cells are killed/suppressed by “regulatory CD11c+CD8+ T cells.” In this review, the origins and functional features of CD137 and CD137L are discussed.